We drove up to St. Albans, the countryside looking beautiful with the recent snowfall, and the autumn colours of the trees highlighted by the sunshine. We met Tania and Robert as usual and went to the Thai restaurant and had a leisurely lunch with lots of chat. We got our shopping quickly afterwards as it got very cold again, and Mas did not want to drive home from St. Albans in the snow as he had done once before. 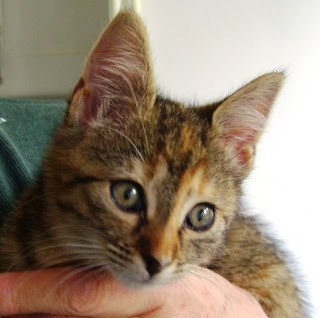 On Thursday we went off to The National Animal and Welfare Trust to see if we could get a kitten. When we arrived we were told that we could only have two kittens, despite the fact that we are home most of the time, so we went home again. After a quick lunch we decided to go to our nearest RSPCA. We headed off towards Shenley and soon found that we were going down narrow country lanes which often ended in a farm. We asked the way several times before we found the place. When we got there we learned that half the cats were quarantined due to cat flu, and that in the healthy group all the kittens were reserved, which meant that someone had reserved them, but that they would have to be visited at home to make sure that the home was suitable. We returned home despondently. Mas took my computer off to see if there was a problem with the hard drive, and I did not seem to have the energy to do very much all day, and that applied to Sunday as well. Christiane phoned, and I made some soup. All pretty uneventful. On Monday morning Glen called in, and we talked of different places to find a kitten amongst other things. Mas took the computer away again so that it could have a diagnosis of the problems which will probably take a week to sort out. Diane phoned, and Chris emailed giving a very graphic description of his stomach upset.....thanks for sharing that Chris! On Tuesday we went shopping, and had a late breakfast at The Man in the Moon where Sunil saw me and came over to chat. He went to school with Toby and is a teacher too. It is half term, but he still had to go into school to work, and was having lunch with the headmaster. It was nice to see him again. The weather turned rather cold, and in the evening there was a thunder storm and later it snowed. 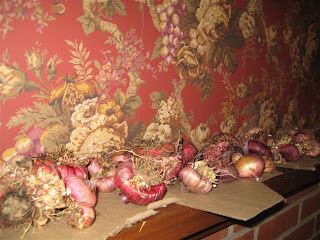 Joan sent this warm picture of bulbs drying on a mantelpiece, and how the colours blend perfectly with the wallpaper. Computer problems and portrait commission. I started to have problems with my computer, which apart from making ominous clicking sounds would flash me messages which would not remain on the screen long enough to read which added to the general feeling of alarm, and the curser would freeze in one spot which did not help. Knowing my limitations (as per Clint Eastwood) I ignored the problem till Mas took it over for me. I began feeling exhausted, but was cheered by a commission to do a portrait. In the evening we watched the miseries of The Bill and Silent Witness before clambering up to bed. Today I spoke to Glen and Barry to ask if, when we get a cat, they would look afer it should we go away later. They agreed to this willingly. Mas spent most of the day doing the computer, and I did a bit of housework and gardening, but began to feel too tired, so stopped. Manu phoned, but I felt too tired to invite him round this evening. Mas and I watched a few Frasiers before bedtime. Ben and Poppy's tenant across the street bought the exercise cycle for us just after breakfast which was kind of him. 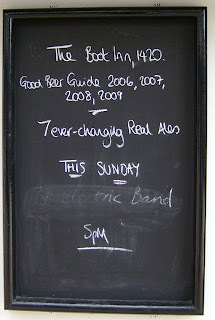 Mas and I went off to Boreham Wood and got some shopping, and I bought a cardigan too. We had another fish and chip lunch, and had a quick look in the pet shop where kittens are marked for sale at £75 each on their notice board, and decided to keep waiting for a rescue kitten . 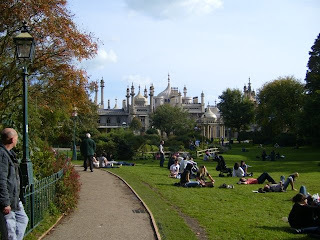 When we got home we had a quick rest, and Monika phoned with her news. She is very busy as Olga is visiting with a friend and staying for ten days. Luckily the children are well. It was really nice to hear from her; Oktay will be going to Paris on business for a few days too. Mas went off to the Broadwalk to meet some people, and have some coffee. While he was doing this I made some quince jelly, having recycled my jam jars recently the jelly was poured into a variety of odd jars, but it tastes nice. Mas had already done the hard work for me while I was in the hospital; thinking I was going to make quince jelly he prepared it the way we do crab apples, cooking the fruit and straining off the juice, so I did make jelly! 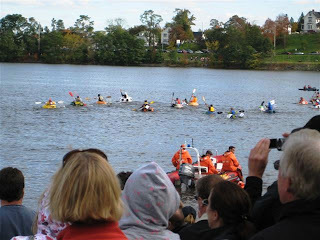 Monday was a rather dreary day, but Joan sent some interesting pictures from Nova Scotia where they do a Great Pumpkin Race across half a mile of lake. 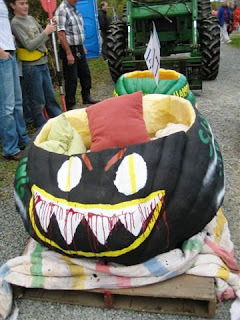 The pumpkins are huge, and hollowed out to make boats which are then painted; it looks like a lot of fun to me. Later we watched a silly film called Big Mamma for a change. On Tuesday I went back to the hospital, and after long muddles and delays with blood tests I saw the specialist who said that I could have my medication today. I had bought the book 'My Name is Red' to read while I was on the drip, but it was very busy in the department and I could not get the use of a table and as it was awkward holding the book up so I did not get very far with it. Luckily I was next to a very nice lady, and we spent some time talking, the nurses on that ward are very friendly too. I left the hospital rather late, but felt well enough to come home on my own. In the evening we watched some of Pete's Frasiers. On Saturday the weather was fine, so I took some late cuttings and hope they will work. I seemed to spend most of the day doing cooking and housework, and was feeling tired when Margaret called round to bring me lots of quinces that John had gathered as I like to make preserves of them; what a nice surprise! In the evening we watched an interesting film starring Sandra Bullock called The Lake House, in which the two main characters are living two years apart in time. It was intriguing to see how they would catch up with each other, but talking about it later we thought the original book must have made a smoother ending without leaving so many questions unanswered. Today I took some more cuttings, and cooked and froze some cooking apples for later use. Pete phoned and chatted, and later Ben phoned from Guernsey with all the latest news. Luckily it turned out that he and Poppy would lend me their exercise cycle as I mentioned that I was going to buy one later and get super fit. We watched Heartbeat and A Touch of Frost in the evening. Mas and I went to Boreham Wood as there are two pet shops there, and we thought we would see if there were any kittens. First we looked in the nearest pet shop, but they did not have any kittens for sale we then had a fish and chips lunch and we got the shopping we needed and thought about finding the next pet shop. We found our car would not start despite trying numerous times to get it going. Finally I was going to call the breakdown recovery people, only to find my phone needed recharging! With the help of the friendly girl in the pet shop we managed to phone and were told help would arrive within the hour. The cheerful breakdown man arrived, got in the car, turned the key, and hey presto it started immediately! We felt duly mortified, but he said it was surprising how often this happens, and after completing the forms he left grinning and waving. We tried a Vets practice, and they gave us useful numbers to try for a rescue kitten. The second pet shop did not have live animals, so we went home. In the evening we watched the concluding parts or The Bill and Silent Witness, and to cheer me up we watched an episode of Jeeves and Wooster. 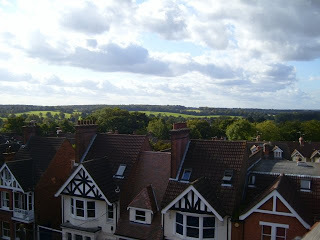 We were going as usual to St. Albans, but our friends phoned and invited us to lunch at their house instead of meeting in town. It was a bright and sunny day and the drive up was lovely. We sat about talking for a while and then we had lunch. Tania had made a delicious fish meal followed by the nicest cheesecake Mas and I have ever tasted. We were having such a nice time talking that we left it too late to go to the market, and as I had got very tired we went directly home afterwards. At home I lay down for a rest, and after a while Florence phoned, and we talked for almost an hour. She has an infectious laugh, and I felt very cheered up. In the evening we watched The Bill and Silent Witness, both with good plots, but very dark stories. Blood test and afternoon tea for three. On Monday morning I went off to the Royal free Hospital early to have a blood test in the hope that it would speed up my treatment tomorrow. Mas also went off to see our doctor at this time. When we came back Margaret phoned to invite us round for tea in the afternoon. Mas could not go, but I went round and briefly talked to Maheena who was just leaving their house. Margaret, John and I talked at length, generally putting the world to rights. When I left, John gave me a bag of his home grown cooking apples and some chillies, which Mas will appreciate, and some Cosmos seeds. Bright and early on Tuesday I sped off to the hospital in the train again. Sadly my blood test showed that the platelets were too low, so the treatment was put off for a week when I will have another blood test. Pete phoned with good news and Mas had also fixed the TV set up while I was out. We watched The Sender, but both thought little of this film. I spent time on Friday morning defrosting and cleaning the fridge before going off to my dentist to see the hygienist. I took her a box of chocolates as a small 'thank you' for the caring treatment she had given me last time I saw her in May. Mas wondered if it was a good idea taking chocolates, but she said she always has three sugars in her tea and has never had a filling! Getting home again I felt really tired, and when Manu phoned I did not really feel up to having a social evening with him, so we left it for another day. On Saturday I defrosted and cleaned the freezer, and afterwards generally lurked around at home taking it easy. In the evening we watched NCIS, and afterwards I listened to music for a while. On Sunday I phoned Pete to wish him a happy birthday, and then as it was such a bright sunny day I did some gardening, and prepared some pots for cuttings, even though I am rather late in the year for this. Mas and I spent some time in the garden drinking tea and relaxing, it is so peaceful sitting under a canopy of leaves with the sunlight shining through them. One of my neighbours who had cancer some time ago told me his story. He said when he found out he was ill he had a row with his wife and stormed out of the house and went to the local shopping centre. He looked at the cards, and there were some posters displayed in a rack that could be spun around. He moved them around and where he stopped it with his hand there was a poster displaying the 'Footprints prayer', he went home again after reading it for the first time. He has a dog, and when out walking in the local woods he saw a branch on a tree that had been broken, and he taped it together; he says he doesn't know why. When he was in hospital just before his operation a clergyman visited him to tell him there was a chapel in the hospital, and he gave him a card with the hospital plan on it showing directions. When he left, my neighbour turned the card over, and there was the 'Footsteps' prayer again. He took this as a good omen. When recovering after leaving hospital he walked in the woods with his dog again, and found the branch he had taped up had grown leaves and was still alive. Later in the year he found that the branch had died, but someone had taped the 'Footsteps' prayer onto the branch. After this coincidence he was convinced he would be well again. That happened ten years ago. On Thursday we got up and were all greeted by a purring Calliope. We has a lovely relaxed breakfast with fresh coffee and bread and currant bread too that Pete had just bought from his favourite bakers. Later I washed up our few dishes, but while I did this Calliope ran up the back of my legs and back so that she could sit on my shoulders and watch everything that was going on in the garden too, I kept putting her on the chair,but she ran up to my shoulders five times. At one point she was standing on my head, and I had to be careful that she did not fall into the water. She is very entertaining and funny. Pete went off briefly to the chiropractor for another session, all useful places seem to be a stone's throw from Pete's house which is really useful. 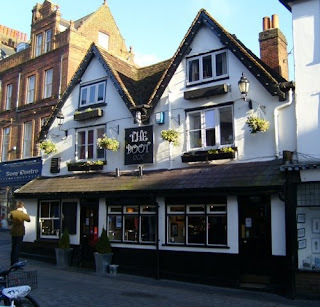 Mas and I packed our stuff up, and we all went to lunch at The Sussex Yeoman pub (just around the corner)where I also managed to get some ginger beer, which is my substitute for red wine for the time being, and a nice lunch. Looking out of the pub window the sunny houses opposite reminded me of Folkestone. Quite soon afterwards we walked to the station and sadly left Pete at the barrier before going off to London on the train. The view crossing over the Thames was very picturesque in the sunlight, and before too long we were home again. 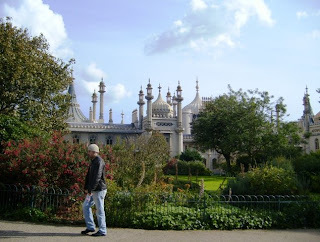 I really enjoyed our Brighton trip and seeing Pete in his sun filled home. I believe Mas wants to get a kitten of our own now as he liked Calliope so much, but we were surprised at how much they cost now. Previously people used to give kittens away and were glad that the cats were going to a good home. Diane had left a few messages so I phoned her and we bought each other up to date with what has been going on. On Saturday Mas had his yearly 'flu' shot before we went off to get shopping and have an early lunch in Stanmore. We watched a 'Midsomer Murders' in the evening. Toby phoned on Sunday, otherwise we just pottered about indoors as it was raining all day, and I did a bit more to Pete's skelly picture. Nothing too exciting was going on until we went off to Brighton to visit Pete. Luckily the weather had changed completely and was bright and sunny, and the countryside, as we sped through it on the train looked lovely. We got to Pete's just before lunch time so we had time to meet Calliope and have a cup of tea and chat. Later we sauntered downtown to a Gourmet Burger Kitchen, and had a huge lunch, and afterwards had a short walk to the Mock Turtle which has wonderful cakes and is a very cosy interesting place. 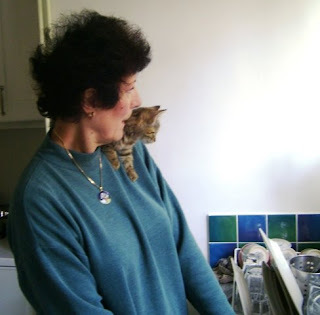 We returned to Pete's home and had a short rest before playing with his kitten a lot while Pete prepared dinner. Lorraine came round after work as planned; it was nice to meet her at last. Unfortunately Pete had a bad migraine so poor Lorraine took over the dinner which was very nice. Pete came back once his migraine fireworks had stopped, and we chatted for a while before Lorraine left and we went off to bed. Today Mas went off at 9a.m. taking the car for a service and the annual MOT, and having left the car at the garage he came back by bus. I left for an appointment at the hospital to have a CT scan. I took my book with me, The Love Apple Island, as I knew I would have to wait for two hours. It was interesting reminising with the authoress about various shops and tea rooms that have changed hands and no longer exist, and she had worked in times past for the Guernsey Press where some of our relatives had worked too. Once the scan was done, I sped away, and ate my sandwhich in the chilly Heath Strange Garden which is on the original site of what was to become the Royal Free Hospital, before going home. Mas eventually picked the car up and got home again after 7 p.m. with this year's MOT cetificate and no extra expenses! We had dinner before watching three very funny Frasiers and so to bed. As usual we drove up to St.Albans and had lunch at Sazio's, after having an emergency ginger beer at the Fleur de Lys, the Boot Inn sadly did not have any ginger beer. Our friends could not meet us as Robert has another exam tomorrow. After lunch we got our usual shopping from the market, and loaded it into the car. This is the view from the car park roof. Once home and rested I spoke to Diane and Pete.